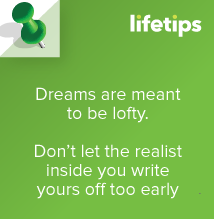 Dreams are meant to be lofty. Don’t let the realist inside you write yours off too early. Doubt. That huge daunting monster that has a way of ruining your plans with it’s negativity and persuasiveness isn’t as huge or as daunting as you think. When we pull back the curtain, we see that doubt is simply the voice of the realist. The realist wants to know the plan, including where the time and money will come from. However, in the early phase of dreaming, you may not know. Don’t let the realist immediately turn into a monster who might judge or obliterate your idea. Give the realist the information it needs. If you ignore or reject it, it will cleverly agitate or distract you. Being realistic offers prudence and makes you do your homework, but if you are overly realistic or go to strategy too soon, you will most likely compromise the dream and kill your passion. Use doubt to your advantage. It is important to be realistic when you are setting your short term goals because this will help you set attainable goals and avoid disappointment. When you hear different voices–the doubt monster and the realist–it becomes difficult to overcome obstacles. When the two voices merge, they can become muddled and result in confusion and poor decisions. You might poison your dream by projecting doubt into it. Then with each step you take toward what you want, you also move toward your doubt. Doubt and fear do not belong in your dream. These feelings are simply part of your reality. Overcoming obstacles may mean getting out of your own way. Don’t let doubt and fear kill off the possibilities of your dream by being overly realistic. Dreams are meant to be lofty. The time to be realistic in the dreaming process is when you are working on strategy. But if you go there too soon, you may compromise your dream before it takes wings. Hear your dreamer’s voice. Let it communicate exactly what it wants, its wildest desires. Turn the volume up so you can also clearly hear its insights, wisdom and gifts. Swing outside of “being realistic” and trust that your dreamer’s voice knows what it needs. Visionaries embody what it means to be a big dreamer. They are able to maintain their focus on success and their strategic plan to achieve that success. Setbacks and failure don’t stop them. Always remember that it is better to try your hardest and fail then to not try at all. True dreamers pull inspiration and motivation from defeat and failure. They consider them learning experiences. Successful dreamers are always learning and changing! Practice makes perfect! Just because you may be slow or ungainly at a task doesn’t mean you should stop. The more you work at it, the better you will become. Find inspiration from a mentor who will help you keep your chin up when you get frustrated. Dreamers look for support and help when it is needed and take failure as a landmark on their path to success! Are you inspired by big dreams? Don’t be afraid to let your inner visionary out! Become a dreamer and you will be one step closer to achieving success. We all have goals, but how many of us actually write them down? We write down grocery lists so we don’t forget anything, but when it comes to our deepest desires and dreams many of us banish those thoughts to the backs of our mind; promising to focus on them later, when the time is right. Well, “later” is right now. Go get a pen and a piece of paper, or open a Word doc as you sit reading this at your computer. Setting goals allows you to determine your own destiny. By knowing precisely what you want to achieve, you’ll understand exactly what you have to do to get there. No more wasting time, energy and money on distractions that don’t get you any closer to where you’re trying to go. To draw an analogy, if you wanted to go to the grocery store, would you fill your tank with gas and drive 20 miles in the opposite direction? No. You would drive directly toward the grocery store. Similarly, once you have a clear idea of where you want to go in life, you will naturally steer yourself there as well. Step 1: Clear your mind and focus on the accomplishments that you would like to achieve. Step 2: Outline a plan to achieve these goals. Do you have to go back to school? Switch careers? Whatever it is, write it down. Step 3: Once you have a plan established, set milestone goals to help you execute your plan. Each milestone goal should be set so that it is challenging but still possible. For example, if you need to go back to school, find out what you have to do to apply. Break it down into an easy step-by-step process. By setting sharp, clearly defined goals, you’ll be able to measure and take pride in their achievement. You will see forward progress in what might have previously felt like a never ending cycle of stagnation. …Unless you’re talking about Italian ice. But generally speaking, no, no it’s not lemon flavor. But that’s okay because when it comes to sweets, Americans don’t care for lemon anyways. What do we want? Chocolate! Anything else? Some peanut butter! Thank you for asking! For years M&M’s have not only been the most popular candy in the US, they held the world title as well. However, as of October 30, 2013 Reece’s has officially surpassed M&Ms as the nation’s top selling candy. Interestingly, 3 of the top 4 candy bars have been around for over 70 years. The Hershey Bar was introduced in 1900, Reece’s in 1928 and M&Ms is the young’un of the group debuting in 1941. It just goes to show, candy has a nostalgic value to it. For many people it quite literally tastes like childhood. What’s YOUR favorite candy? What was it when you were little? What’s your favorite chocolate combination?